In the present study we have investigated the role of the secreted p60 protein from Listeria monocytogenes as an Ag for CD4 T cells. The p60 protein is an abundant extracellular protein that is highly conserved within the members of the genus Listeria. Our results show that L. monocytogenes infection induces a potent p60-specific Th1 immune response. Remarkably, we found that p60-specific Th1 clones mediate significant protection against L. monocytogenes infection. For one p60-specific clone, the peptide epitope was defined. This clone recognized p60 301-312 (EAAKPAPAPSTN) in the context of the H-2Ad molecule. Despite the fact that acquired immunity against L. monocytogenes is primarily mediated by cytotoxic CD8 T lymphocytes, our data clearly demonstrate that secreted bacterial proteins are important CD4 T cell Ags and that Th1 clones specific for a secreted bacterial protein can contribute to the protection against an intracellular pathogen such as L. monocytogenes. Protection against infection with the facultative intracellular bacterium L. monocytogenes is mediated by natural and acquired immunologic mechanisms (1, 2). Several studies have shown that macrophages, neutrophils (3), NK cells (4), and γδ-T cells (5, 6) are responsible for host defense in the early phase of infection. Clearance of infection requires activation of macrophages by IFN-γ (7, 8). In contrast to natural immunity, acquired immunity against L. monocytogenes depends on αβ-T cells. The contribution of different T cell subpopulations for the expression of acquired immunity to L. monocytogenes is still controversial. Experiments using T cell subset depletion in vivo (9, 10, 11, 12) and transfer of specific T cell subsets (13, 14, 15, 16) demonstrated that CD8 T cells are the principal mediators of acquired antilisterial immunity. In contrast to these reports, others found evidence for a significant role of CD4 T cells (8, 17, 18, 19). The analysis of L. monocytogenes infection in MHC class I- and II-deficient mice that are devoid of CD8 or CD4 T cells, respectively, demonstrated the importance of MHC class I- and II-restricted effector cells in acquired resistance against L. monocytogenes (6). In vivo, L. monocytogenes escapes from the hostile extracellular environment into the phagosome of the host cell. Subsequently, after lysis of the phagosomal membrane, L. monocytogenes enters the less aggressive milieu of the cytoplasm, where extensive multiplication occurs (20). In this cellular compartment, secreted bacterial Ags, such as the pore-forming toxin listeriolysin O (LLO),3 have direct access to the MHC class I Ag-processing machinery (21). Transfer of cytotoxic CD8 T cells specific for single secreted proteins of L. monocytogenes, e.g., the exotoxin LLO or the p60 protein, conferred significant protection against L. monocytogenes (22, 23). These experiments led to the hypothesis that secreted bacterial Ags are important target molecules for L. monocytogenes-specific CD8 T cells (23). The remarkable protection against L. monocytogenes mediated by p60 or LLO-specific class I-restricted T cells fits into the paradigmatic scheme of Ag presentation that distinguishes cytoplasmatic MHC class I-presented Ags and endosomal class II-presented Ags (24). L. monocytogenes-specific CD4 T cells recognize various secreted and somatic bacterial proteins (25, 26, 27). The CD4 T cell response against the exotoxin LLO, which is required for this pathogen’s entry from the phagosome into the cytoplasm of eukaryotic cells, and the functional properties of this molecule have been characterized thoroughly (21, 28, 29). However, the protective potential of LLO-specific CD4 T cells against infection with L. monocytogenes as well as the functional and immunologic properties of other proteins recognized by L. monocytogenes-specific CD4 T cells are unknown. In the present study, the role of p60 as Ag for L. monocytogenes-specific CD4 T cells was investigated. The p60 protein is a major extracellular protein produced by all members of the genus Listeria (30). The amino acid sequence comparison of the whole p60 protein family revealed that the amino- and carboxyl-terminal portions are highly conserved in all Listeria species, while the inner portions of the p60 differ in a species-specific way (30). The p60 protein exhibits a murine hydrolase activity and is essential for a late step in bacterial cell division. The p60 protein from pathogenic L. monocytogenes is also involved in the adherence to certain types of eukaryotic cells and contributes to the uptake of L. monocytogenes into fibroblasts and macrophages (30, 31, 32). In this communication, we show that L. monocytogenes infection induces a strong p60-specific CD4 T cell response. The analysis of individual p60-specific T cell clones revealed that all clones belonged to the Th1 subtype. Remarkably, we found that p60-specific Th1 clones mediated significant adoptive protection against L. monocytogenes infection. We defined the peptide epitope and MHC restriction for one representative p60-specific Th1 clone. This clone recognized the peptide EAAKPAPAPSTN (p60 301-312) in the context of the H-2Ad molecule. Even though acquired immunity against L. monocytogenes is primarily mediated by CD8 T cells, our data demonstrate that Th1 cells, specific for an abundant secreted bacterial protein, can mediate protection against an intracellular cytoplasmatic pathogen such as L. monocytogenes. The strong antilisterial activity of p60-specific Th1 clones corroborates the importance of secreted bacterial proteins as target Ags for protective CD4 T cells. Female BALB/cOlaHsd mice (H-2d), C57BL/6J (H-2b), and C3H/HeNHsd (H-2k) mice were purchased (Harlan-Winkelmann, Borchen, Germany), kept under conventional conditions, and used at 6 to 8 wk of age. L. monocytogenes serovar 1/2a EGD was obtained from S. H. E. Kaufmann, University of Ulm, Ulm, Germany. For p60 purification, the nonhemolytic L. monocytogenes EGD MR1 (33) was transformed with plasmid pGB363-1p60 carrying the iap gene (34) to overproduce p60. Heat-killed L. monocytogenes (HKL) were obtained by incubating bacteria at 70°C for 90 min. Bacteria were washed twice in PBS and stored at −70°C until use. Supernatants from L. monocytogenes MR1 pGB363-1p60 cultures were harvested at early stationary growth phase (OD550 = 3.6), precipitated with 7% (final concentration) TCA on ice for 3 h, washed with cooled acetone (−20°C), dissolved in Laemmli sample buffer (35), heated at 95°C for 20 min, and separated by SDS-PAGE. After staining, the 60-kDa band representing the p60 protein was excised and transferred into a Biotrap BT 1000-chamber (Schleicher & Schüll, Dassel, Germany), for overnight elution at 100 V with protein elution buffer (25 mM Tris, 132 mM Glycin, 0.025% SDS) and dialysis against 50 mM Tris/HCL, pH 8.8, containing 0.01% Tween-20. To confirm purity, aliquots of the protein samples were separated by SDS-PAGE and either stained with Coomassie blue or transferred onto nitrocellulose by semi-dry electroblotting in a graphite chamber (36) for immunoblot analysis with a rabbit anti-p60 antiserum (37). The Ab reaction was performed for 2 h with a 1000-fold dilution in Tris-buffered saline containing 3% BSA and 0.05% Tween-20. Binding of anti-p60 Abs was visualized by subsequent incubations of the filter with horseradish peroxidase-conjugated swine anti-rabbit Ig and 4-chloro-1-naphthol (0.5 mg/ml) with 0.025% hydrogen peroxide. For the identification of T cell epitopes, soluble overlapping oligopeptides were generated by the spot synthesis technique with a cleavable proline/Boc-lysine anchor (38). This technique allows the multiple synthesis of peptides on a cellulose support, using 9-fluorenylmethoxycarbonyl amino acid esters, and the cleavage of the generated peptides directly into pH 7 buffer, as described by Bray, Maeji, and Geysen (39). After side chain deprotection with trifluoroacetic acid/dichloromethane/triisobutylsilane/water (47:48:3:2, v/v/v/v) and sonication in 0.1% HCl in water/methanol (1:1) for 15 min, the cellulose sheet was soaked in 0.1 M phosphate-citrate buffer at pH 3 for 5 h. The individual peptide spots were excised and distributed into different 1.5-ml tubes for cleavage due to diketopiperazine formation at neutral pH (e.g., 0.1 M pH 7 phosphate buffer). Initially, a complete overlapping 20-mer peptide library (offset = 15 amino acids) of the p60 protein from L. monocytogenes was prepared. For precise mapping, deca- and dodecapeptide libraries (offset = 1 amino acid) covering the previously identified antigenic region were synthesized. Definitive amounts of peptides capable of inducing T cell proliferation were synthesized and verified as peptide amides using a Tentagel RAM resin on a Zinsser Analytic SMPS 350 A peptide synthesizer (Zinsser, Frankfurt, Germany) as described by Jung et al. (40). Triple fluorescence FACS analyses were performed with commercially available reagents (Pharmingen, Hamburg, Germany). Cells were stained with FITC-labeled hamster IgG anti-mouse TCRαβ mAb (clone H57-597), phycoerythrin (PE)-labeled rat IgG1 anti-mouse CD8 mAb (clone 53-5.8), and CyChrome (CyCr; PharMingen, San Diego, CA)-labeled rat IgG2a anti-mouse CD4 mAb (clone RM4-5). Unspecific Fc-receptor-mediated binding of mAb was blocked by rat IgG2b anti-mouse CD16/CD32 (clone 2.4G2). Unspecific staining was controlled with appropriate FITC-, PE-, or CyCr-labeled isotype controls, respectively. Cells were analyzed on a FACScan (Becton Dickinson, Heidelberg, Germany). A gate for TCRαβ+ cells was set and the relative percentage of CD4 and CD8 T cells was calculated using the WinMDI software package. After treatment with erythrocyte lysing buffer (Sigma, Deisenhofen, Germany), whole spleen cell suspensions were inactivated for 20 min with 50 μg/ml of mitomycin C at 37°C in an agitated water bath. After washing four times with culture medium, cells were used as accessory cells for all experiments. Inactivation of accessory cells was routinely checked by [3H]thymidine incorporation into Con A (Sigma)-stimulated accessory cells. Mice were immunized i.p. with 5 × 103 CFU L. monocytogenes followed by 1 × 106 CFU 14 days later. After 7 to 14 days, spleens were removed and bulk cultures were established in 24-well flat-bottom plates with an initial concentration of 15 × 106 spleen cells per well in 1.5 ml of cell culture medium (α modification of Eagles medium; PAA, Wien, Austria) supplemented with 10% FCS, 100 U/ml penicillin, 100 μg/ml streptomycin, 1 × 10−5 M 2-ME, 2 mM glutamine, and 0.5 μg/ml amphothericin B (αMEM) and 5 μg/ml purified p60. After an initial 5-day culture, period T cells were grown in αMEM supplemented with 20 U of recombinant murine (rm)IL-2/ml (R&D, Wiesbaden-Nordenstadt, Germany). Bulk cultures and cloned T cells were restimulated every 2 to 3 wk with 6 × 106 inactivated accessory cells per 1 × 106 T cells per well of a 24-well plate in αMEM supplemented with 20 U rmIL-2 per ml and 5 μg/ml purified p60. T cell clones were established from p60-specific bulk cultures by limiting dilution cloning. Each well of a 96-well round-bottom microtiter plate received 2 × 105 inactivated accessory cells, and 100, 30, 10, 3, or 1 T cell(s) per well in αMEM containing 20 U rmIL-2 per ml and 5 μg/ml purified p60. Positive wells from cultures with less than 30% of positive wells were considered monoclonal and were expanded for further analysis. The typical cloning efficiency of p60-specific bulk cultures was 5 to 10%. T cell activation was measured by proliferation of T cells and by detection of IL-2 in culture supernatants as described by Safley et al. (28). For all tests, 5 × 104 T cells were cultured with 2 × 105 inactivated accessory cells and the appropriate Ag in 150 μl of αMEM per well in round-bottom 96-well microtiter plates. Culture supernatants were harvested 18 to 24 h after initiation of cultures. Proliferation of T cells was quantified by [3H]thymidine incorporation: 0.5 μCi of [3H]thymidine (Amersham Buchler, Braunschweig, Germany) was added 96 h after initiation of the culture and after a further 18 h of incubation, cells were harvested on glass fiber filters and bound radioactivity was measured with a QuickSafe (Zinsser) scintillator in a liquid scintillation counter. IL-2 activity in supernatants was detected with IL-2-dependent HT-2 cells: 5000 HT-2 cells were incubated with 50 μl of supernatant and 100 μl of αMEM. [3H]Thymidine was added after 24 h and proliferation of HT-2 cells was measured as described above. MHC restriction of T cell clones was tested by inhibition studies with MHC class II-specific mAb as described by Tsuji et al. (41). Accessory cells (2 × 105/well) were cultured overnight with 5 μg/ml of purified p60. Graded doses of anti-H-2Ad mAb (clone MKD6) or anti H-2Ed-mAb (ascites from clones 14.4.4S or 34-1-4S, respectively; Cedarlane, Ontario, Canada) were added. After 2 h of incubation, 5 × 104 T cells were added to each well and culture supernatants were harvested after a further 6-h incubation. IL-2 activity was tested with IL-2-dependent HT-2 cells as described above. Supernatants from T cell cultures were produced as described above for the IL-2 screening test. ILs were quantitated by IFN-γ, IL-2, IL-4, or IL-10-specific sandwich ELISA kits (Genzyme, Cambridge, MA) that bind and detect ILs with pairs of specific mAb. All assays were performed as suggested by the manufacturer. IL production of individual clones was calculated from the titration of supplied calibrated rIL standards. Results were corrected for dilution of the sample to yield the sample concentration in pg/ml. Bone marrow macrophages were grown by standard procedures (42) and used as target cells in a cell-mediated cytotoxicity assay. Briefly, bone marrow cells were differentiated for 12 days in the presence of 500 U/ml of recombinant murine macrophage colony stimulating factor (R&D). Differentiated macrophages were used after a further 2 days of incubation in the presence of 25 U of rmIFN-γ. Cells were harvested and infected with L. monocytogenes from a log phase culture with a multiplicity of infection of 50 bacteria per macrophage. After 30 min at 37°C, gentamicin was added to a final concentration of 50 μg/ml and cells were washed three times. After a further 3-h incubation, macrophages were labeled with 51Cr and used as target cells in a standard 4-h 51Cr release assay (43). Effector to target cell ratios were 120:1, 40:1, 12:1, and 4:1. The spontaneous release of infected targets was between 15 and 25%. Th1 clones were used 10 to 14 days after the last restimulation. T cells were harvested and washed twice in PBS before i.v. injection of 1 × 107 cells in 0.5 ml of Ca2+-, Mg2+-, and pyrogen-free PBS (PAA). Animals were subsequently infected by i.v. injection of 1 × 104 CFU L. monocytogenes in 0.2 ml of PBS. Spleens and livers were removed 72 h after infection and were homogenized in Tenbroeck tissue grinders (Wheaton, Millville, NY) with 5 ml of sterile distilled water. Homogenates were diluted serially and aliquots of relevant dilutions were plated on tryptose agar. Colonies were enumerated after 48 h of incubation. Colony counts were corrected for dilution and averaged to yield CFU/organ. Data are presented as the average of individual experiments with four mice per group. Each experiment was performed at least twice with similar results. The statistical significance of the results was tested as described below. The statistical analysis of the results of in vitro experiments was performed with the Newman-Keuls multiple comparison test at the 0.05 significance level. The statistical significance of the results of in vivo experiments was checked with the nonparametric Tukey multiple comparison test at the 0.05 significance level. All tests were performed using the WINKS statistical analysis software (Texasoft, Cedar Hill, TX). After entering the endosome, secreted bacterial proteins have direct access to the MHC class II Ag presentation pathway of the host cell (21). LLO, the secreted cytolysin of L. monocytogenes, has been identified as a strong T cell Ag for CD4 Th cells (28). Because p60 is secreted in large amounts, we analyzed the role of p60 as Ag for L. monocytogenes-specific CD4 T cells. Therefore, the p60 protein was purified from bacterial supernatants of the LLO-negative mutant strain L. monocytogenes EGD MR1 that overproduced p60 after transformation with plasmid pGB363-1p60 carrying the iap gene (33, 34). SDS-PAGE analyses of TCA-precipitated supernatants demonstrated that p60 is a major secreted protein from iap-transformed L. monocytogenes EGD MR1 (Fig. 1⇓A, lane 1). After purification, the p60 preparation revealed a homogenous molecular mass of 60 kDa without any visible contamination (Fig. 1⇓A, lane 2). 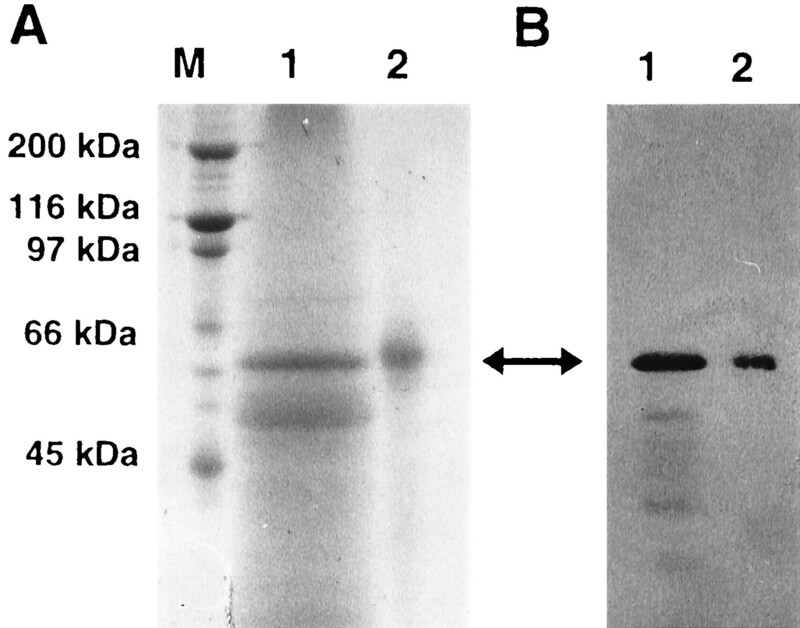 The identity of the 60-kDa protein was confirmed by Western blot analysis with a p60-specific antiserum (Fig. 1⇓B). Purification of the secreted p60 protein from the p60-overproducing strain L. monocytogenes EGD MR1 pGB363-1p60. Purification of p60 from culture supernatants was performed by TCA precipitation followed by preparative SDS gel chromatography. Aliquots of p60 preparations were analyzed by SDS-PAGE. Proteins were visualized directly with Coomassie blue (A) or blotted on nitrocellulose and analyzed with an anti-p60 antiserum (B). Lane M, m.w. standards; lane 1, TCA-precipitated supernatant from pGB363–1p60 transformed L. monocytogenes EGD MR1; lane 2, purified p60 protein. The arrowheads indicate the p60 protein. The p60-mediated activation of T cells in splenocyte cultures was measured in an IL-2 production assay. BALB/c mice were infected i.p. with 5 × 103 CFU of L. monocytogenes and were boosted after 2 wk with 1 × 106 CFU. Spleens were removed 1 wk later and splenocytes were cocultured with graded doses of either purified p60 (Fig. 2⇓, main) or HKL as control (Fig. 2⇓, inset). After 24 h, culture supernatants were harvested and IL-2 activity was screened with IL-2-dependent HT-2 cells. IL-2 activity was exclusively detected in cultures of spleen cells from L. monocytogenes-infected mice. No IL-2 activity was observed in uninfected control mice. The level of detected IL-2 activity correlated well with the dose of p60 given (in the range between 25 μg/ml and 0.2 μg/ml). The minimal amount necessary to induce significant IL-2 activity was between 0.2 and 1 μg/ml. Remarkably, the p60-specific response in the presence of 25 μg/ml of p60 (Fig. 2⇓, main) was almost as strong as the response to whole HKL (Fig. 2⇓, inset) at the optimal concentration of 1 × 107 HKL/well. From this experiment, it was concluded that L. monocytogenes infection primes BALB/c mice for a strong p60-specific T cell response. Spleen cells from L. monocytogenes-immune BALB/c mice are activated by p60. Spleen cells from naive mice (open symbols) or L. monocytogenes-infected mice (filled symbols) were incubated with graded amounts of either purified p60 or HKL (inset). The relative IL-2 activity in culture supernatants was measured by [3H]thymidine incorporation into IL-2-dependent HT-2 cells. Results are expressed as mean cpm ± SD of triplicates. The further analysis of p60-specific T cells was done with T cell clones established by limiting dilution cloning of p60-specific T cells from bulk cultures. Clones were expanded by repeated restimulation in the presence of p60 protein, inactivated accessory cells, and rmIL-2. The rapidly growing clones 1A, 3D, 5F, and 6G were selected for further characterization. The p60-dependent proliferation of T cell clones was monitored by [3H]thymidine incorporation. Cloned T cells were cocultivated with inactivated accessory cells in the presence of graded amounts of either purified p60 (Fig. 3⇓A, main) or HKL (Fig. 3⇓A, inset). No exogenous rmIL-2 was supplemented to the culture medium. All clones revealed a dose-dependent p60-specific proliferation, but in the presence of HKL no significant proliferation occurred. The sensitivity for p60 of individual clones was estimated as the lowest Ag concentration that induced significant proliferation above background level. The significance was checked with the Newman-Keuls multiple comparison test at the 0.05 significance level. The highest sensitivity for p60 showed clone 1A, which proliferated even in the presence of 0.04 μg/ml of p60. Clone 3D was approximately fivefold less sensitive and detected a minimal p60 concentration of 0.2 μg/ml. Significant proliferation of clones 6G and 5F was observed with a minimal p60 concentration of 5 μg/ml. Supplementation of 20 U of rmIL-2 to cultures enhanced the background level but did not result in significant enhancement of p60 sensitivity of individual T cell clones (data not shown). 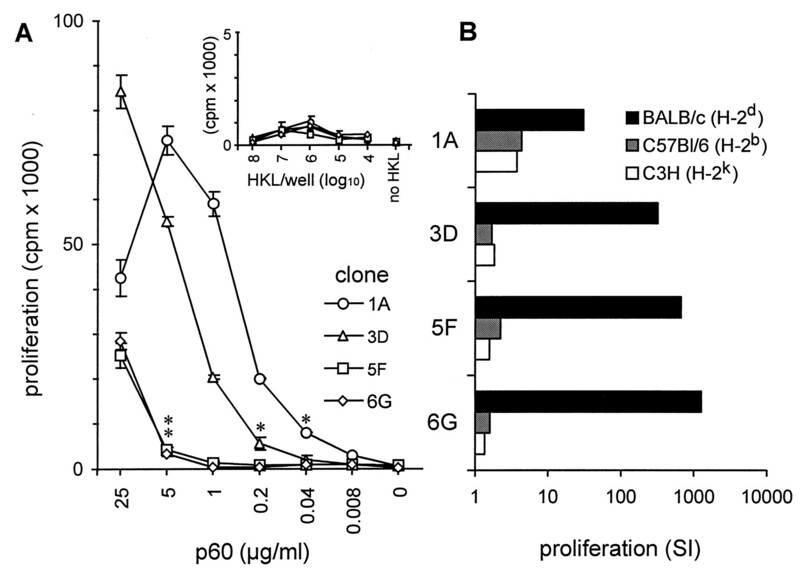 The MHC restriction of clones was tested by cocultivation of T cells with inactivated syngenic BALB/c (H-2d) or allogenic C57BL/6 (H-2b) and C3H (H-2k) spleen cells in the presence or absence of purified p60 (Fig. 3⇓B). The ratio between [3H]thymidine incorporation with or without p60 is indicated as the stimulation index (SI). All clones showed a vigorous proliferative response in the presence of syngenic spleen cells and p60. With syngenic spleen cells the SI was between 30-fold (clone 1A) and 120-fold (clone 6G). In the presence of allogenic spleen cells the SI was between 1.5- and 4-fold. p60-Specific T cell clones recognize p60 in the presence of H-2d restriction elements. T cell clones 1A, 3D, 5F, and 6G were established from bulk cultures after repeated restimulation with purified p60 protein. A, Cloned T cells (1A, 3D, 5F, 6G) were incubated with graded amounts of either purified p60 protein or HKL (inset) in the presence of inactivated accessory cells. The proliferation of T cell clones was measured by incorporation of [3H]thymidine. Results are expressed as mean cpm ± SD of triplicates. An asterisk (*) indicates the lowest p60 concentration that induced significant proliferation of individual T cell clones (Newman-Keuls multiple comparison test at p < 0.05). B, Cloned T cells were incubated with accessory cells in the presence or absence of 25 μg/ml of purified p60. Accessory cells were syngenic BALB/c (H-2d, black bars) or allogenic C57BL/6 (H-2b, hatched bars) or C3H (H-2k, open bars) mitomycin C-inactivated spleen cells. Results are expressed as mean SI of triplicate cultures. Triple fluorescence FACS analyses with anti-TCRαβ-FITC, anti-CD4−PE, and anti-CD8−CyCr mAb revealed a strictly TCRαβ+CD4+CD8− phenotype. Figure 4⇓ represents data obtained with clone 1A. More than 99% of all cells were TCRαβ+ (Fig. 4⇓A, filled histogram). Unspecific staining of a FITC-labeled isotype control was not observed (Fig. 4⇓A, open histogram). Almost 100% of all gated TCRαβ+ cells revealed the CD4+CD8− phenotype (Fig. 4⇓B). Also, more than 98% of cells from clones 3D, 5F, and 6G were TCRαβ+CD4+CD8− (data not shown). p60-Specific T cell clones belong to the Th subset. Cloned p60-specific T cells were stained with FITC-labeled anti-TCRα 47 β mAb, CyCr-labeled anti-CD4 mAb, and PE-labeled anti-CD8 mAb or with fluorescent-labeled isotype controls. Data show a representative analysis of clone 1A. A, Overlay of single color histograms (FITC-anti-TCRα 47 β fluorescence) of cells stained with specific (filled histogram) or control (open histogram) mAb. 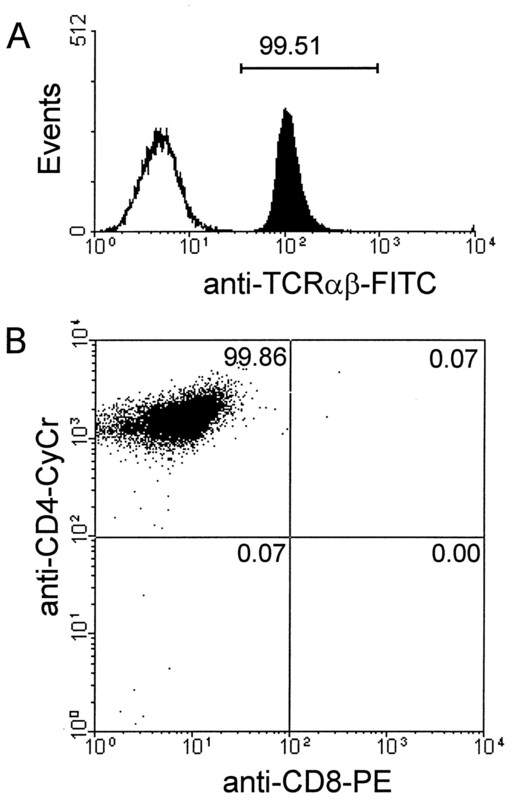 B, TCRα 47 β-positive cells were gated and analyzed for expression of CD4 and CD8. These results indicate that L. monocytogenes infection of BALB/c mice induces p60-specific H-2d-restricted TCRαβ+ CD4+CD8− cells that do not cross-react with HKL. The cytokine pattern divides CD4 T cells into the Th1 and Th2 subpopulations (44). For the typing of p60-specific CD4 T cell clones, IFN-γ, IL-2, IL-4, and IL-10 production into culture supernatants was measured by sandwich ELISA (Table I⇓). T cells were cocultured with accessory cells in the presence or absence of purified p60 and, after 24 h, culture supernatants were removed and the IL content was measured. Table I⇓ shows the results of a representative experiment. The significance of all results was checked with the Newman-Keuls multiple comparison test at the 0.05 significance level. For comparison, clones were ranked according to IL production and grouped (indicated by parentheses): IFN-γ, 1A>(5F>6G>3D); IL-2, (1A>3D)>(5F>6G); IL-4, (1A>5F); IL-10, 3D>(5F>6G>1A). The means of any two clones belonging to the same group are not significantly different (p < 0.05). Thus, all clones produced a high amount of IFN-γ. IL-2 was also produced by all clones, but clones 1A and 3D produced 20- to 70-fold more IL-2 than clones 5F and 6G. Significant IL-10 levels were produced by all clones. However, clone 3D produced 10- to 30-fold more than all other clones. Only clones 1A and 5F produced a low but significant amount of IL-4, the IL-4 production by clones 3D and 6G was below the detection limit. In conclusion, the principal IL pattern of all clones (i.e., IFN-γ high, IL-4 low) is typical for Th1 cells (44). Clone 3D, which additionally produced a high amount of the Th2 IL IL-10, exhibits an intermediate Th1/Th2 phenotype. Lysis of L. monocytogenes-infected cells is an important effector mechanism of protective CD8 T cells in vivo (45). Previous reports demonstrated that L. monocytogenes-specific CD4 T clones may also exhibit cytolytic activity (19). Thus, lysis of L. monocytogenes-infected bone marrow macrophages by p60-specific CD4 T cells was tested in a standard 4-h 51Cr release assay. 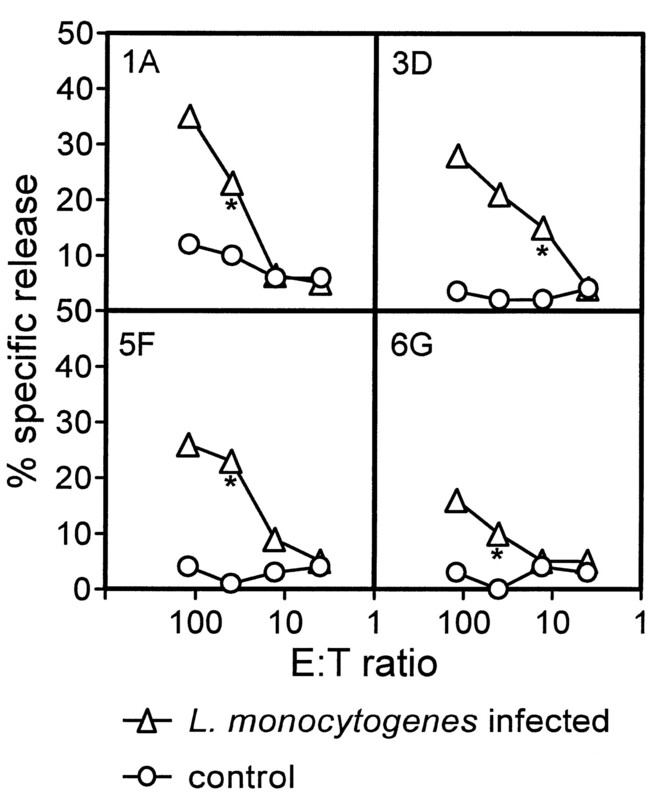 As shown in Figure 5⇓, all p60-specific Th1 clones specifically lysed L. monocytogenes-infected syngenic target cells at E:T ratios of between 120:1 and 4:1. Lysis of uninfected macrophages was not observed. p60-Specific T cell clones lyse L. monocytogenes-infected bone marrow macrophages. L. monocytogenes-infected (triangles) or noninfected (circles) bone marrow macrophages were used as target cells in a standard 4-h 51Cr release assay. Graded amounts of effector cells from clones 1A, 3D, 5F, or 6G were added to yield final E:T ratios of 120:1, 40:1, 12:1, and 4:1. The mean percentage of specific lysis of triplicates is indicated. The spontaneous release of infected target cells was 23%. Asterisks (*) indicate the lowest E:T ratio of individual T cell clones that resulted in significant target cell lysis (Newman-Keuls multiple comparison test at p < 0.05). CD4 T cells recognize short peptides bound to MHC class II molecules on the cell surface of APCs. Typically, MHC class II-bound peptides comprise 12 to 16 amino acids. In contrast to MHC class I-bound peptides, the length of naturally processed class II-bound peptides is variable, and bound peptides do not reveal an obvious MHC class II binding motive (46). Since the Th1 clone 1A was significantly more sensitive for p60 than all other clones, the submolecular specificity of clone A1 was determined. For epitope mapping, a peptide library of 94 overlapping 20-mer peptides that cover the whole p60 protein was synthesized. The offset of subsequent 20-mer peptides was five residues. All fractions were tested with clone 1A in the presence of syngenic accessory cells and IL-2 activity in supernatants was screened with HT-2 cells. Fraction 60 corresponding to the 20-mer PKAPTEAAKPAPAPSTNTNA (p60 296-315) revealed high IL-2 activity (Fig. 6⇓A) and T cell proliferation (data not shown). Some activity was also detected in the neighboring fractions 59 and 61. Fine mapping of the antigenic peptide was accomplished with dodecamer and decamer peptide sublibraries overspanning the antigenic p60 region 289 to 318. Only peptide EAAKPAPAPSTN (p60 301-312) of the dodecamer library with one residue offset between subsequent peptides was found to be biologically active (Fig. 6⇓B). No activity was obtained with any peptide of the decamer peptide library with one residue offset (Fig. 6⇓C). In a further experiment, the specificity of clone 1A was confirmed with newly synthesized, HPLC-purified p60 301-312 peptide. As few as 1 × 10−9 mol/L p60 301-312 or purified p60 protein activated clone 1A (Fig. 6⇓D); all other clones did not react to the p60 301-312 peptide (data not shown). Characterization of the submolecular specificity of the p60-specific Th1 clone 1A by peptide mapping. Peptide recognition by Th1 clone 1A was measured as IL-2 activity in culture supernatants. A-C, Mapping of the antigenic region was done initially with a set of 94 overlapping 20-mer peptides (A) that overspan the complete p60 sequence. The offset between subsequent peptides was five residues (no. 1: p60 1–20; no. 2, p60 16–35 ...). Fine mapping of the antigenic epitope of peptide no. 60 (p60 296–315) was done with sets of dodecamer (B) and decamer (C) peptides. D, The result of the peptide mapping analysis was confirmed with synthetic HPLC-purified p60 301-312 peptide. Ag-specific proliferation of clone 1A was measured in the presence of graded concentrations of purified p60 protein (circles) or p60 301-312 (squares). Results are expressed as mean SI of triplicate cultures. MHC class II-positive BALB/c cells express Ad and Ed molecules. The MHC class II restriction of clone 1A was tested by the inhibition of T cell activation with MHC class II-specific mAb. Accessory cells were incubated overnight with purified p60. T cells were added after 2 h of preincubation with graded doses of mAb specific for Ad or Ed. 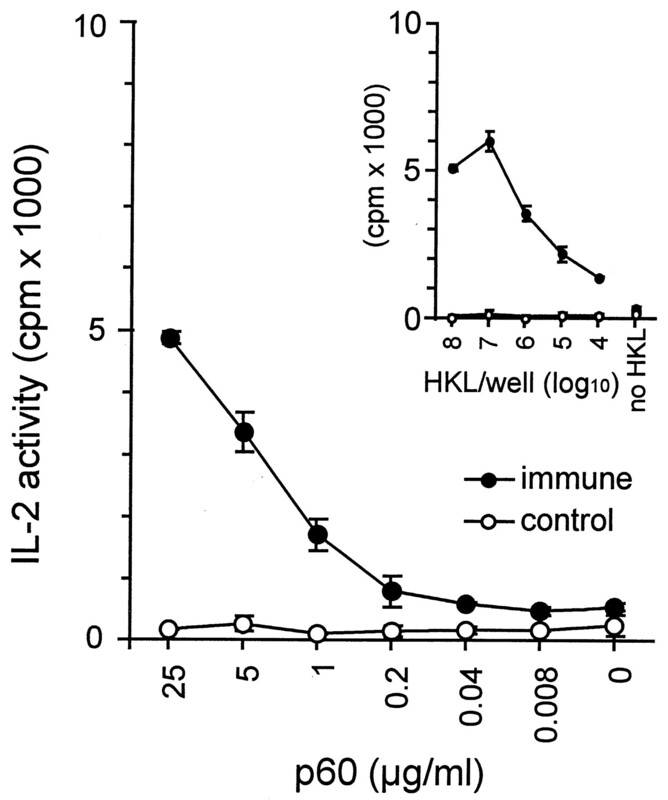 The data represent IL-2 activity in supernatants 6 h after addition of T cells (Fig. 7⇓). 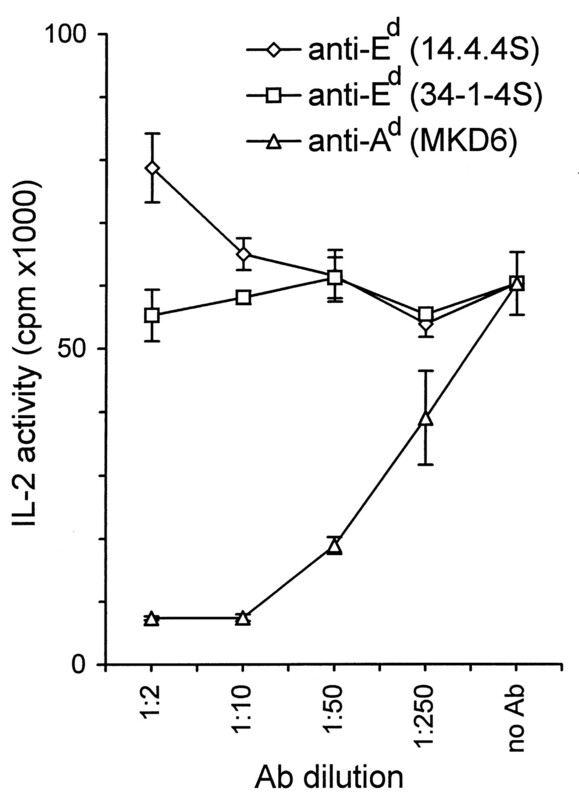 Blocking of Ad molecules with anti-Ad-mAb resulted in an 88% decrease of IL-2 activity. Blocking of Ed molecules with two different Ed-specific mAb did not decrease T cell activation. MHC restriction of Th1 clone 1A. Inactivated accessory cells were pulsed overnight with 5 μg/ml of purified p60. Subsequently, accessory cells were blocked with various dilutions of anti-Ad-specific (clone MKD6) or anti-Ed-specific (clone 14.4.4S or clone 34-1-4S) mAb. The IL-2 activity in supernatants was determined 6 h after addition of the CD4 T cell clone 1A. Results are expressed as mean cpm ± SD of triplicates. From these data we concluded that the p60-specific T cell clone 1A is H-2Ad-restricted and recognizes a peptide related to p60 301-312. Previous reports considered cytolytic CD8 T cells specific for secreted bacterial proteins of utmost importance for the acquired immune response against L. monocytogenes (22, 23). To test the protective potential of p60-specific Th1 cells, adoptive transfer experiments were performed with p60-specific CD4 T cell clones. Mice received 1 × 107 p60-specific CD4 cells i.v., were subsequently challenged with 1 × 104 CFU L. monocytogenes i.v., and 72 h after infection the bacterial load was determined in spleen and liver (Fig. 8⇓). Remarkably, all clones significantly (p < 0.05) decreased the bacterial load in the spleens. 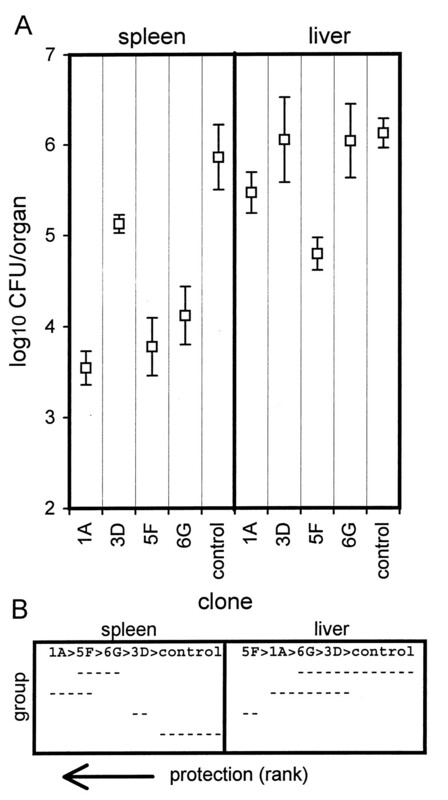 After adoptive transfer of Th1 clones, the protection in the spleen (reported as difference of log10 CFU) was 2.32 (clone 1A), 0.73 (clone 3D), 2.09 (clone 5F), or 1.74 (clone 6G), respectively. Significant protection in the liver was only observed after transfer of clones 1A (0.65, p < 0.05) and 5F (1.33, p < 0.005). Transfer of clones 3D (0.07) and 6G (0.08) did not result in significant protection in the liver. These data demonstrate that individual cloned Th1 cells with specificity for the secreted p60 protein or even with specificity for a defined p60 peptide epitope can confer significant protection against L. monocytogenes in vivo. p60-Specific Th1 clones confer adoptive immunity against L. monocytogenes infection. BALB/c mice received i.v. 1 × 107 cloned p60-specific CD4 T cells (clones 1A, 3D, 5F, 6G) and were subsequently challenged i.v. with 1 × 104 CFU L. monocytogenes. Control groups received no cells. A, The bacterial load of spleen and liver was determined 72 h postinfection. Results are expressed as mean log10 CFU ± SD of groups of four mice. B, Statistical analysis of results was performed with the Tukey multiple comparison test (p < 0.05). T cell clones were ranked according to the protection mediated in spleen or liver. The graphical representation of the Tukey test indicates the rank and group of each clone. The means of any two clones belonging to the same group (underscored by the same line) are not significantly different. CD8 T cells specific for the secreted proteins p60 and LLO of L. monocytogenes mediate a potent antilisterial activity if transferred to naive recipients (22, 23). From these experiments it was hypothesized that secreted bacterial proteins are the most important Ags recognized by protective CD8 T cells (23). The enhanced antigenicity of secreted bacterial proteins has been demonstrated recently with recombinant bacterial vectors that induced a protective T cell response only if the antigenic protein was delivered in secreted form (47). In contrast to reports that described the in vivo activity and molecular specificity of CD8 T cells (22, 23), we focused on the investigation of p60-specific CD4 T cells. We could show that a strong p60-specific Th1 response was induced during murine L. monocytogenes infection. Adoptive transfer of p60-specific Th1 clones with a defined phenotype and specificity for the p60 protein, or even specific for the p60 301-312 peptide, mediated protection against L. monocytogenes infection. Protection by strictly p60-specific Th1 clones that exhibit no cross-reactivity with HKL demonstrates the importance of secreted proteins as target Ags for L. monocytogenes-specific CD4 T cells. Intracellular bacteria live, survive, and multiply inside the cells of the host organism. In general, bacteria such as L. monocytogenes, residing in the cytoplasm of the host cell, induce a protective CD8 T cell response (48), whereas infections by bacteria such as Mycobacterium tuberculosis (49) and Salmonella spp. (50) residing in the endosome of the host cell are controlled by a CD4 T cell response. L. monocytogenes has been used for decades as a model organism for the study of the infections by intracellular pathogens. The protective potential of CD4 T cells, CD8 T cells, and various other cell populations has been the subject of numerous reports (3, 8, 9, 10, 11, 12, 13, 14, 15, 16, 17, 18, 19, 22, 23, 51). The general conclusion of these studies was that acquired immunity against L. monocytogenes is primarily mediated by CD8 T cells. More recently, the study of L. monocytogenes infection in MHC class II-deficient, CD4 T cell-negative mice clearly demonstrated the contribution of CD4 T cells to the protective immune response against L. monocytogenes (48). Adoptive transfer experiments with L. monocytogenes-specific cloned CD4 T cells have been reported (19, 52). The cytokine pattern of CD4 T cell clones used for these experiments was only partially defined, and the clones described by Kaufmann et al. required additional in vivo application of IL-2 (19). Most importantly, these CD4 T cell clones were grown by repeated restimulation with HKL and therefore their molecular specificity was not defined. We have shown that p60-specific Th1 clones exhibit no cross-reactivity with Ags processed from HKL. From these results it can be concluded that p60-specific Th1 cells recognize epitopes processed from p60 secreted by living bacteria. Additionally, the comparison of the proliferative response of spleen cells from L. monocytogenes-infected mice against purified p60 and HKL, which was almost equal, indicates that p60 must be a dominant Ag for Th cells in vivo. The comparison of the protective potential, the p60 sensitivity, and the IL production of individual p60-specific Th1 clones indicated a substantial functional heterogeneity. The functional heterogeneity of these clones argues against the possibility that the in vitro conditions artificially selected clones with unphysiologic functional properties. Remarkably, the protective activity of p60-specific Th1 clones in vivo did not correlate with the sensitivity of p60 recognition or with the ability to lyse L. monocytogenes-infected bone marrow macrophages in vitro. However, the analysis of the cytokine pattern of individual p60-specific CD4 T cell clones indicated a correlation of IL-10 production with a diminished protection against L. monocytogenes in vivo. Clone 3D, which is distinguished from all other clones by a 10-fold higher production of IL-10, was significantly less protective in the spleen. Recent studies with IL-10-deficient mice demonstrated the adverse effect of this cytokine in the primary and secondary immune response against L. monocytogenes (53). Remarkably and in contrast to IL-10 production, the IL-2 production phenotype, i.e., IL-2 high (clones 1A, 3D) or IL-2 low (clones 5F, 6G) did not correlate with antilisterial protection. It is known that L. monocytogenes-specific CD4 T cells recognize LLO (28) and other secreted or somatic bacterial proteins that are not yet defined (25, 26, 27, 54). The present communication defines the p60 molecule as an important target Ag for L. monocytogenes-specific CD4 T cells in vivo. Therefore, the p60 molecule is the first L. monocytogenes CD4 T cell Ag for which the significance of recognition by Ag-specific cloned CD4 T cells could be demonstrated in vivo. Listeria-specific CD4 T cells could act by direct lysis of target cells (19, 51) or by an IL, e.g., IFN-γ-mediated mechanism (55). The importance of IFN-γ secreted by Th1 cells has been demonstrated by depletion of IFN-γ after adoptive transfer of HKL-specific CD4 T cell lines (55). Thus it is generally accepted that protection by Listeria-specific CD4 T cells can be attributed to the production of IFN-γ whereas Listeria-specific CD8 T cells exert antilisterial activity by perforin-mediated cytolysis (45, 55). The target cells on which L. monocytogenes-specific CD4 T cells act in vivo are unknown. By an IFN-γ-mediated mechanism, CD4 cells could either act directly on infected target cells or on infected bystander cells (56). Following i.v. infection, L. monocytogenes is phagocytosed by macrophages in the spleen and liver, and the majority of bacteria are killed rapidly (57). However, some bacteria are able to escape from the bactericidal activity of the phagosome into the cytoplasm and from there by cell to cell spread into hepatocytes that express a lower level of antimicrobial activity. Thus, within 12 h of infection the majority of all viable bacteria reside in hepatocytes (57). Compared with hepatocytes, which predominantly express MHC class I Ags, phagocytic cells are MHC class I and class II positive or can at least be induced to express MHC class II molecules (58). However, the ability of CD8 T cells to recognize MHC class II-negative target cells is not the only explanation for the superior antilisterial potential of MHC class I-restricted CD8 T cells. This was demonstrated by the recent study of protection mediated by adoptive transfer of L. monocytogenes-specific CD8 T cells in bone marrow chimeric mice (59). These experiments revealed that CD8 T cell recognition of bone marrow-dependent phagocytic cells results in a more potent antilisterial immunity than does recognition of bone marrow-independent target cells (59). The enhanced protection by p60-specific CD4 T cell clones in the spleen compared with the liver would be in accordance with the assumption that CD4 T cells act predominantly on class II-positive phagocytes, which are the principal target of L. monocytogenes in the spleen. In the liver, evasion of bacteria into hepatocytes, which express low levels of MHC class II molecules, would protect the bacteria from recognition by p60-specific CD4 cells. However, this protection pattern, which could be expected from the cell tropism of L. monocytogenes, was not observed in previous adoptive transfer studies with CD8-depleted spleen cells from immune mice (17) or HKL-specific CD4 T cell clones or lines (19, 52, 55). In these animal systems, CD4 cells exhibited enhanced protection in the liver compared with the spleen. No conclusive explanation for this preferential liver tropism exists. However, it has been speculated that the enhanced protection mediated by CD4 T cells in the liver might be due to preferential recognition of Ags processed from killed bacteria by activated macrophages after release of bacteria from hepatocytes (17). Compared with HKL-specific CD4 cells, Ag recognition by p60-specific Th1 cells depends on active secretion of p60 inside the infected cell. Thus the specificity for secreted or somatic bacterial proteins might influence the tropism of Listeria-specific CD4 cells in vivo. MHC class II-presented peptides are generated by acidic proteolysis of endocytosed proteins in the endosomal compartment (24). The epitope recognized by clone 1A (p60 301-312, EAAKPAPAPSTN) is presented by the MHC class II molecule Ad. Remarkably, p60 301-312 contains three prolyl residues, and alignment of p60 301-312 with most other known Ad ligands (60, 61, 62) does not reveal obvious similarities or the presence of the canonical Ad binding motif. However, the high proline content of p60 301-312 is shared with HSVgd 245-260 (APYSTLLPPELSETP), which even contains four prolyl residues and also lacks the Ad-binding motif (60). Therefore, p60 301-312 corroborates the previous hypothesis that, because prolyl residues tend to disrupt certain ordered secondary structures, proline-rich peptides may conform to different structural rules that govern Ad binding capacity compared with nonproline-containing peptides (60). In general, human infection by pathogenic L. monocytogenes is asymptomatic, and clinical infection is predominantly observed during pregnancy or immunosuppression (63). It is accepted that resistance against L. monocytogenes infection is caused by a high degree of natural immunity (63). As demonstrated here for the model system of the murine L. monocytogenes infection, CD4 T cells contribute to the protection against L. monocytogenes in which p60 is substantially involved. Because p60 shares highly conserved protein portions with the p60 of nonpathogenic Listeria (30), this suggests an additional explanation for the high degree of preexisting immunity against L. monocytogenes: apathogenic L. innocua, which is considered as the most frequent Listeria species detected in various contaminated foods (64), might lead to inapparent infection that primes or enhances the CD4 T cell-mediated immunity against L. monocytogenes infection. Because the p60 molecule of pathogenic L. monocytogenes and apathogenic L. innocua display more than 90% homology (30), cross-reactivity of T cells against molecules of both Listeria strains can be expected (65). Also, the H-2Ad-restricted epitope p60 301-312 described in the current report is conserved in L. innocua with the exception of position 1, which is a glutamine residue in the L. innocua p60 and a glutamic acid residue in L. monocytogenes p60 (30). Therefore, it will be of interest to determine whether L. monocytogenes p60-specific CD4 T cells cross-react with the L. innocua p60 and whether infection with this apathogenic Listeria species enhances the T cell-mediated protective immunity against pathogenic L. monocytogenes. We thank Caroline Günther for excellent technical assistance, and Rafaela Holtappels (University of Mainz), Justin Daniels (University of Würzburg), and David Diamond (Loma Linda University) for critical review of the manuscript. ↵1 This work was supported by the Forschungsfond der Fakultät für Klinische Medizin Mannheim der Universität Heidelberg, Projekt 29/96. Mio Lalic is a stipendiate of the Graduiertenkolleg Infektiologie funded by the Deutsche Forschungsgemeinschaft. ↵3 Abbreviations used in this paper: LLO, listeriolysin O; αMEM, α modification of Eagles medium with supplements; SI, stimulation index; PE, phycoerythrin; CyCr, CyChrome; HKL, heat-killed L. monocytogenes; rm, recombinant murine. Portnoy, D. A.. 1994. Cellular biology of Listeria monocytogenes infection. V. L. Miller, and J. B. Kaper, and D. A. Portnoy, and R. R. Isberg, eds. Molecular Genetics of Bacterial Pathogenesis 279 ASM, Washington DC. Trinchieri, G., and B. Perussia. 1985. Immune interferon: a pleiotropic lymphokine with multiple effects. Immunol. Today 131.